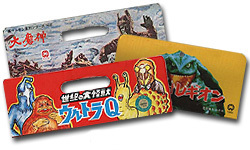 the first time I saw a vinyl kaiju i thought it was the cheapest piece of crap i'd ever seen. big words coming from a guy who collects jumbo machinders. they just seemed so... basic. i soon realized that was their charm. even after i started warming up to them, i was still generally unimpressed. sure there was the occasional bullmark that was truly amazing, i even bought a few. 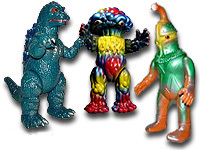 but with the the japanese vinyl toy market the way it is, there was no way a casual passer by such as myself was going to start throwing down any real money for the more sought after originals. besides, i still had jumbos to buy. that was until i got my grubby little hands on a toy made by a newer company in japan, m1 gou. i was awestruck. the production quality, the paint jobs (which are all done by hand), the sculpts... so impressive. then i got another. and another. and now its too late to go back. i'm not trying to build some kind of m1 information database here and i don't know if i'll ever have a collection worth mentioning, but if nothing else, here's my graphical tribute to m1 gou.